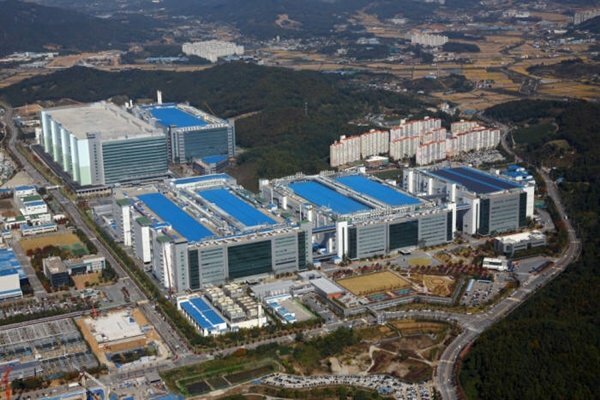 Samsung Display is planning to construct world’s biggest OLED plants which will have more than 30% of production capacity than A3 that is currently Samsung Display’s biggest plant. Its strategy is to grab upper hands by expanding its production capacity before Chinese businesses have technical skills in flexible OLED. According to industries on the 28th, Samsung Display has started constructing 6th generation flexible OLED production line called ‘A5 (tentative name)’, which has production capacity of 180,000 panels per month and up to 270,000 panels per month, at its new sites in Cheonan and Asan. It notified such plan to some of its main front-end process equipment manufacturers and is mediating with them regarding schedule for supply and demand of equipment. Samsung Display is going to hold a board of directors meeting next month and is going to finalize its plans for investments on its new plant. Since this new plant is going to be bigger than A3, it is likely that Samsung Display will invest more than $1.75 billion (2 trillion KRW) just to construct this plant. If it starts construction during second half of this year, it will take about a year and half to finish construction. If it starts bringing in equipment at the end of next year, it is likely that mass-production will start from 2019. Industries estimate that Samsung Display will need about $14.0 billion (16 trillion KRW) just for equipment if it wants to make investments so that its new plant has production capacity of 180,000 panels per month. 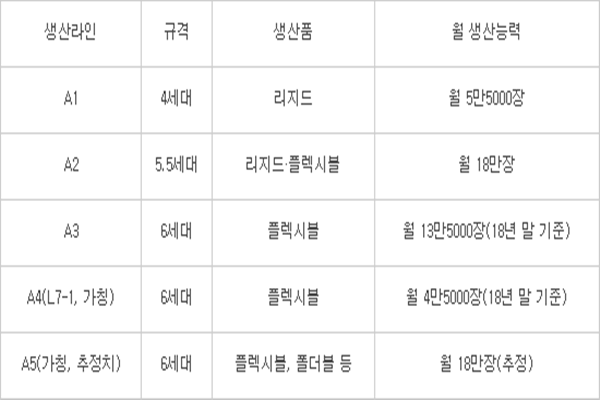 If it makes investments that will produce 60,000 panels per month as part of first stage of investment, it will cost Samsung Display about $4.37 billion (5 trillion KRW) just to purchase equipment. Total duration of investment is 3 years and it is heard that Samsung Display will continue ordering equipment from second half of this year until first half of 2021. Samsung Display is also looking into making investments that will have two plants produce total of 270,000 panels per month. This means that each plant will have production capacity of 135,000 panels per month. If it wants to make such investment, it will have to make investments between $20.1 billion and 21.0 billion (23 trillion KRW and 24 trillion KRW). If Samsung Display carries out investments by separating them into two, it is likely that it will make investments that will create production capacity of 30,000 and 60,000 per month during second half of this year and next year respectively. Samsung Display started extending A3 plant on full-scale during second half of 2015 due to the fact that Apple ordered large amount of OLEDs. In order to supply panels to Apple and Samsung Electronics, it is understood that Samsung Display has secured production capacity of 135,000 panels per month over two years span. Construction of A3 plant is still not complete as Samsung Display is continuing to bring in equipment and it is likely that it will be done in upcoming October. Size of a location where A5 plant is going to be constructed is similar to sizes of A3 plant and A2 plant that produces 180,000 5.5th generation rigid and flexible OLEDs per month. Unlike A3 plant, it is heard that Samsung Display is going to speed up its investments for A5 plant. In case of A3 plant, Samsung Display had kept it empty for about a year after constructing it and not deciding on what to produce from it and started making facility investments on full-scale during second half of 2015. Reason why Samsung Display is speeding up its investments is because it has to mass-produce foldable displays. Although size of a Smartphone panel is between 5 and 6 inches, size of foldable device is between 9 and 10 inches as it is a new product that can be used for Smartphones and tablets. It is likely that Samsung Display’s active investment will cause an aspect of ‘a game of chicken for OLED’. Since Samsung controls 98% of global markets for small and medium flexible OLED, there won’t be any space for new businesses if it continues to grab upper hands in market demands with aggressive supplies. If Samsung Display greatly increases its output, it can reduce price even more. If it secures output, technologies, and price before appearance of new businesses on full-scale, it can create an enormous entry barrier. Samsung has an experience in winning a game of chicken in semiconductor markets. By reducing prices of memories and carrying out decisive facility investments in advance and sizeable economic strategies, it has earned itself the number one place in global memory markets. As a result, many American, Japanese, and Taiwanese semiconductor businesses such as Qimonda and Elpida went bankrupt and narrowed seven-way race into three-way race. Regarding Samsung Display’s investment on a new plant, its representative said that Samsung Display has not decided on any investments regarding a new plant.